We talk with Elizabeth George about the latest in her Inspector Lynley series, The Punishment She Deserves. Then, Anthony Horowitz of Foyle’s War, House of Silk and the Alex Rider mysteries tells us about his new book, The Word Is Murder. It’s a meta-mystery romp that invites the reader in behind the scenes of writing mystery fiction. Like the great writer P.D. James, Elizabeth George’s murder mysteries explore in depth the psychological motivations of her characters. She’s best known for her Inspector Lynley series, now counting twenty, including her latest, The Punishment She Deserves. The first eleven in the series have been adapted for BBC TV as The Inspector Lynley Mysteries. In The Punishment She Deserves, the working class Sergeant Barbara Havers teams up again with aristocratic Inspector Thomas Lynley to solve the murder of the local deacon in the historic town of Ludlow, England. As usual, the pair must fight the headwinds of testy superiors who seem more concerned about insubordination than about solving the murder. And almost anyone could be the killer. The setting is a character, too — small-town England in the grip of austerity, where there aren’t enough policemen anymore to keep the town safe. 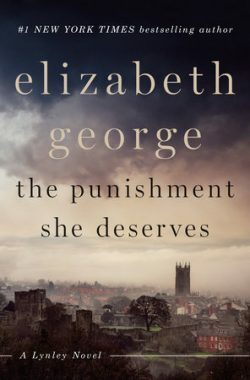 The lies we tell ourselves to avoid confronting our pain is a major theme of the novel — and the consequences lead the characters to “the punishment they deserve.” Once again, In The Punishment She Deserves, Elizabeth George has succeeded in creating a masterful work of suspense. Anthony Horowitz is the bestselling author of, among many others, Magpie Murders, House of Silk and Moriarty, as well as the TV crime dramas Foyle’s War and Midsomer Murders. Now, he’s brilliantly reinvented the classic crime novel by writing a fictional version of himself as a Watson to a modern-day Holmes. 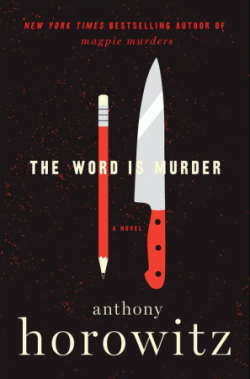 In his latest The Word is Murder, (out June 5 from Harper Collins,) Horowitz has created a meta-mystery that’s hugely fun to read — “meta” because it’s a vehicle for the author to invite us behind the scenes of what it takes to write a mystery novel. When Diana Cowper enters a funeral parlor one morning to plan her own funeral, she doesn’t know that 6 hours later she’ll be dead, strangled with a curtain cord in her own home. Former police detective Daniel Hawthorne is brought in to solve the case. He’d left Scotland Yard under a cloud, but he’s still the go-to man for the cops when the case is too tough for them to crack. But Hawthorne wants someone to write his story, to restore his reputation. In an inventive twist, he hires Anthony Horowitz himself. The two develop a testy relationship, as they battle over how the book will be written. That’s all part of the fun in reading the book. Meanwhile, the plot wends its intricate way to a surprising resolution. We spoke with Anthony Horowitz last year about Magpie Murders, which also featured a mystery writer. This time, in The Word is Murder, Anthony Horowitz steps forward from behind the curtain to create a masterful mystery that showcases his talent at its best. Anthony Horowitz is the author many works of crime fiction, including novels, screenplays and plays. We honor two momentous anniversaries — one a hard-won victory, the other a terrible tragedy. June 6, 1944 was D-Day, when the Allies invaded Western Europe in the largest amphibious attack in history. The Allies were able to establish a beachhead on the Atlantic coast despite the formidable defenses of the German army and begin the liberation of France. We talk with novelist Stephen Kiernen about his novel The Baker’s Secret. The action culminates on D-Day but told from the perspective of French civilians who were liberated on that day. Then, June 6, 1968 was the day that Bobby Kennedy was assassinated. just a few months after the assassination of Martin Luther King. We talk with David Margolick about his groundbreaking book The Promise and the Dream: The Untold Story of Martin Luther King, Jr. And Robert F. Kennedy.